The lifeblood of non-profits are the donors who provide funding for projects and the volunteers who carry out the mission of the organization. Critical components to sustaining the mission of non-profits include the ability to simultaneously recruit new volunteers while retaining experienced volunteers. 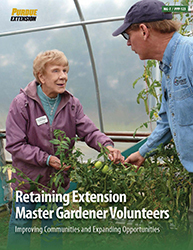 This publication gives a positive and encouraging approach to coordinating the PMG program that includes training, recognition, and new challenges will motivate dedicated volunteers to stay committed to the mission of assisting Purdue Extension with home horticulture education in Indiana communities.